Insulin resistance is associated with elevated serum pigment epithelium-derived factor (PEDF) levels in morbidly obese patients. Obesity is a significant risk factor for developing diabetes. Pigment epithelium-derived factor (PEDF) has been identified by experimental and clinical studies as both a causative and counter-regulatory factor in the metabolic syndrome. We set out to determine whether serum PEDF levels correlated with the degree of insulin resistance in morbidly obese patients. Sera from 53 patients who were evaluated prior to gastric bypass surgery were analyzed for PEDF levels using a commercial ELISA. None of the patients were on diabetes medications prior to enrollment. Baseline data included BMI, serum glucose and insulin, and homeostasis model assessment (HOMA) scores. Patients were stratified based on HOMA score and glucose levels into three groups: insulin sensitive (IS): HOMA <2 and glucose <126; insulin resistant (IR): HOMA >2 and glucose ≤126; and diabetes mellitus (DM): HOMA >2 and glucose >126. Pre- and post-gastric bypass sera from 12 patients were obtained for serial assessment of metabolic parameters and PEDF levels. PEDF secretion was assessed in primary human hepatocytes, HCC cells, and cultured adipocytes in the absence and presence of high glucose media. No significant differences in age, gender, and BMI were found among the three groups. PEDF levels were similar between IR patients and the other groups, but were significantly higher in DM compared to IS patients (p = 0.01). Serum PEDF in individual patients declined significantly after gastric bypass (p = 0.006). High glucose media led to significantly higher PEDF release by human hepatocytes in vitro (p = 0.016). These data demonstrate that serum PEDF concentrations better relate to insulin resistance than to adiposity and suggest that PEDF expression is closely linked to the development of insulin resistance. Pigment Epithelium-Derived Factor (PEDF) Peptide Eye Drops Reduce Inflammation, Cell Death and Vascular Leakage in Diabetic Retinopathy in Ins2(Akita) Mice. Inflammation, neurodegeneration and microvascular irregularities are included in the spectrum of defects associated with diabetic retinopathy. Here, we evaluated intraocular deliverability features of two pigment epithelium-derived factor (PEDF) derivatives given as eye drops and their efficacy in modulating diabetes-induced retinal complications. The antiangiogenic PEDF60-77 (P60) and neuroprotective PEDF78-121 (P78) derivatives were applied to Ins2(Akita) mouse eyes once a week for 15 wks at the onset of hyperglycemia. Peptides, labeled with Alexa Fluor 488, were observed penetrating the cornea by 1-4 h and gained access to the ciliary body, retinal pigment epithelium (RPE)-choroid complex, retina microvasculature and vitreous. Peak vitreous levels were 0.2 μg/mL for P60 and 0.9 μg/mL for P78 after 0.5 and 4 h, respectively. Both peptides reduced vascular leakage by ~60% and increased zona occludens 1 (ZO1) and occludin expression in the microvasculature to nondiabetic levels. P60 induced pERK1/2 and P78 promoted pAKT in Muller glia, two signals that were dampened in diabetic conditions. Pharmacologically inhibiting AKT signaling in the retina blocked effects of the peptides on ZO1 and occludin expression. P78 reduced levels of 9/20 cytokines in diabetic vitreous including interferon (IFN)-γ, interleukin (IL)-6, IL-3 and tumor necrosis factor (TNF)-α. P60 lowered levels of 6/20 cytokines but was less effective than P78. Neuroprotective P78 prevented diabetes-induced microglia activation by ~60%, retinal ganglion cell (RGC) death by ~22% and inner plexiform layer thinning by ~13%. In summary, we provide evidence that PEDF bioactive derivatives gained access to the retina by topical delivery and validated their efficacy in reducing diabetic retinopathy complications. Our findings argue for glia regulation of microvascular leakage and an early root cause for RGC degeneration embedded in microglia activation. Liu Y, et. al. Mol Med. 2012 Dec 20;18:1387-401. doi: 10.2119/molmed.2012.00008. Positive correlation between PEDF expression levels and macrophage density in the human prostate. BACKGROUND: In this study, we investigated the capacity of pigment epithelium-derived factor (PEDF) to modulate the recruitment and the differentiation of monocytes/macrophages both in vitro and in human prostate. METHODS: Using Boyden chambers, we assessed PEDF effect on the migration of monocytes and chemically activated RAW 264.7 macrophages. Normal, prostatitis, and prostate cancer specimens were retrospectively selected and examined by immunohistochemistry for PEDF expression and infiltration of immune CD68 + macrophagic cells. PEDF expression and macrophage density were then correlated with each other and clinicopathological parameters. M1 and M2 differentiation markers were quantified by qRT-PCR, Western blotting, and ELISA. RESULTS: In chemotaxis, PEDF induced the migration of monocytes/macrophages. In immunohistochemistry, macrophages were markedly increased in prostatitis and malignant compared to normal tissues. PEDF was expressed at variable levels in the stroma and epithelium. PEDF mRNA was down-regulated in both prostate cancer and prostatitis compared to normal tissues. In correlation studies, macrophage density and PEDF expression were respectively positively and negatively associated with prostate size. Most importantly, PEDF expression positively correlated with macrophage density. Finally, PEDF stimulated the expression of iNOS, IL12, and TNFα; and inhibited IL10 and arginase 1 in mouse and human macrophages confirming a M1-type differentiation. CONCLUSIONS: Our data demonstrate that PEDF acts directly on monocytes/macrophages by inducing their migration and differentiation into M1-type cells. These findings suggest a possible role of macrophages in PEDF anti-tumor properties and may support further development of PEDF-based anti-cancer therapy. Pigment epithelium-derived factor blocks tumor extravasation by suppressing amoeboid morphology and mesenchymal proteolysis. Metastatic melanoma cells are highly adaptable to their in vivo microenvironment and can switch between protease-dependent mesenchymal and protease-independent amoeboid invasion to facilitate metastasis. Such adaptability can be visualized in vitro, when cells are cultured in conditions that recapitulate three-dimensional microenvironments. Using thick collagen layers in cell culture and in vivo extravasation assays, we found that pigment epithelium-derived factor (PEDF) suppressed lung extravasation of aggressive melanoma by coordinated regulation of cell shape and proteolysis. In cells grown on a thick collagen bed, PEDF overexpression and exogenous PEDF blocked the rapidly invasive, rounded morphology, and promoted an elongated, mesenchymal-like phenotype associated with reduced invasion. These changes in cell shape depended on decreased RhoA and increased Rac1 activation and were mediated by the up-regulation of Rac1-GEF, DOCK3 and down-regulation of Rac1-GAP, ARHGAP22. Surprisingly, we found that PEDF overexpression also blocked the trafficking of membrane-tethered, MT1-MMP to the cell surface through RhoA inhibition and Rac1 activation. In vivo, knockdown of Rac1 and DOCK3 or overexpression of MT1-MMP was sufficient to reverse the inhibitory effect of PEDF on extravasation. Using functional studies, we demonstrated that PEDF suppressed the rounded morphology and MT1-MMP surface localization through its antiangiongenic, 34-mer epitope and the recently identified PEDF receptor candidate, PNPLA2. Our findings unveil the coordinated regulation of cell shape and proteolysis and identify an unknown mechanism for PEDF's antimetastatic activity. Ladhani et al., Neoplasia. 2011 Jul;13(7):633-42. A PEDF-Derived Peptide Inhibits Retinal Neovascularization and Blocks Mobilization of Bone Marrow-Derived Endothelial Progenitor Cells. Proliferative diabetic retinopathy is characterized by pathological retinal neovascularization, mediated by both angiogenesis (involving mature endothelial cells) and vasculogenesis (involving bone marrow-derived circulating endothelial progenitor cells (EPCs)). Pigment epithelium-derived factor (PEDF) contains an N-terminal 34-amino acid peptide (PEDF-34) that has antiangiogenic properties. Herein, we present a novel finding that PEDF-34 also possesses antivasculogenic activity. In the oxygen-induced retinopathy (OIR) model using transgenic mice that have Tie2 promoter-driven GFP expression, we quantified Tie2GFP(+) cells in bone marrow and peripheral blood by fluorescence-activated cell sorting (FACS). OIR significantly increased the number of circulating Tie2-GFP(+) at P16, correlating with the peak progression of neovascularization. Daily intraperitoneal injections of PEDF-34 into OIR mice decreased the number of Tie2-GFP(+) cells in the circulation at P16 by 65% but did not affect the number of Tie2-GFP(+) cells in the bone marrow. These studies suggest that PEDF-34 attenuates EPC mobilization from the bone marrow into the blood circulation during retinal neovascularization. Longeras et al, Exp Diabetes Res. 2012;2012:518426. Epub 2011 Jun 28. Pigment epithelium-derived factor regulates lipid metabolism via adipose triglyceride lipase. OBJECTIVE: Pigment epithelium-derived factor (PEDF) is an adipocyte-secreted factor involved in the development of insulin resistance in obesity. Previous studies have identified PEDF as a regulator of triacylglycerol metabolism in the liver that may act through adipose triglyceride lipase (ATGL). We used ATGL(-/-) mice to determine the role of PEDF in regulating lipid and glucose metabolism. RESEARCH DESIGN AND METHODS: Recombinant PEDF was administered to ATGL(-/-) and wild-type mice, and whole-body energy metabolism was studied by indirect calorimetry. Adipose tissue lipolysis and skeletal muscle fatty acid metabolism was determined in isolated tissue preparations. Muscle lipids were assessed by electrospray ionization-tandem mass spectrometry. Whole-body insulin sensitivity and skeletal muscle glucose uptake were assessed. RESULTS: PEDF impaired the capacity to adjust substrate selection, resulting in a delayed diurnal decline in the respiratory exchange ratio, and suppressed daily fatty acid oxidation. PEDF enhanced adipocyte lipolysis and triacylglycerol lipase activity in skeletal muscle. Muscle fatty acid uptake and storage were unaffected, whereas fatty acid oxidation was impaired. These changes in lipid metabolism were abrogated in ATGL(-/-) mice and were not attributable to hypothalamic actions. ATGL(-/-) mice were also refractory to PEDF-mediated insulin resistance, but this was not related to changes in lipid species in skeletal muscle. CONCLUSIONS: The results are the first direct demonstration that 1) PEDF influences systemic fatty acid metabolism by promoting lipolysis in an ATGL-dependent manner and reducing fatty acid oxidation and 2) ATGL is required for the negative effects of PEDF on insulin action. Borg et al., Diabetes. 2011 May;60(5):1458-66. Epub 2011 Apr 4. Administration of pigment epithelium-derived factor inhibits left ventricular remodeling and improves cardiac function in rats with acute myocardial infarction. Oxidative stress and inflammation are involved in cardiac remodeling after acute myocardial infarction (AMI). We have found that pigment epithelium-derived factor (PEDF) inhibits vascular inflammation through its anti-oxidative properties. However, effects of PEDF on cardiac remodeling after AMI remain unknown. We investigated whether PEDF could inhibit left ventricular remodeling and improve cardiac function in rats with AMI. AMI was induced in 8-week-old Sprague-Dawley rats by ligation of the left ascending coronary artery. Rats were treated intravenously with vehicle or 10 µg PEDF/100 g b.wt. every day for up to 2 weeks after AMI. Each rat was followed until 16 weeks of age. PEDF levels in infarcted areas and serum were significantly decreased at 1 week after AMI and remained low during the observational periods. PEDF administration inhibited apoptotic cell death and oxidative stress generation around the infarcted areas at 2 and 8 weeks after AMI. Further, PEDF injection suppressed cardiac fibrosis by reducing transforming growth factor-ß and type III collagen expression, improved left ventricular ejection fraction, ameliorated diastolic dysfunction, and inhibited the increase in left ventricular mass index at 8 weeks after AMI. The present study demonstrated that PEDF could inhibit tissue remodeling and improve cardiac function in AMI rats. Substitution of PEDF may be a novel therapeutic strategy for cardiac remodeling after AMI. Ueda et al., Am J Pathol. 2011 Feb;178(2):591-8. Pigment epithelium-derived factor (PEDF) is one of the most abundant proteins secreted by human adipocytes and induces insulin resistance and inflammatory signaling in muscle and fat cells. OBJECTIVE: Pigment epithelium-derived factor (PEDF) is a multifunctional protein with neurotrophic and anti-angiogenic properties. More recently it became evident that PEDF is upregulated in patients with type 2 diabetes and also contributes to insulin resistance in mice. During characterization of the secretome of in vitro differentiated human adipocytes by two-dimensional polyacrylamide gel electrophoresis and matrix-assisted laser desorption/ionization-MS, we found that PEDF is one of the most abundant proteins released by adipocytes. The aim of this study was to investigate the regulation and autocrine function of PEDF in human adipocytes and to determine its paracrine effects on human skeletal muscle cells (hSkMC) and human smooth muscle cells (hSMC). METHODS AND RESULTS: Human primary adipocytes secrete 130 ng ml(-1) PEDF over 24 h from 1 million cells, which is extremely high as compared with adiponectin, interleukin-6 (IL-6) or IL-8. This release of PEDF is significantly higher than from other primary cells, such as adipose-tissue located macrophages (50-times), hSkMC and hSMC (5-times). PEDF protein expression significantly increases during adipogenesis, which is paralleled by increased PEDF secretion. Furthermore, tumor necrosis factor-a and hypoxia significantly downregulate PEDF protein levels. PEDF secretion was significantly reduced by troglitazone and hypoxia and significantly increased by insulin. Treatment of adipocytes and hSkMC with PEDF induced insulin resistance in adipocytes, skeletal and smooth muscle cells at the level of insulin-stimulated Akt phosphorylation, which was dose dependent and more prominent in adipocytes. Furthermore, inflammatory nuclear factor-?B (NF-?B) signaling was induced by PEDF. In hSMC, PEDF induced proliferation (1.7-fold) and acutely activated proliferative and inflammatory signaling pathways (NF-?B, p38 mitogen-activated protein kinase and mammalian target of rapamycin). Famulla et al, Int J Obes (Lond). 2011 Jun;35(6):762-72. doi: 10.1038/ijo.2010.212. Epub 2010 Oct 12. OBJECTIVE: We aimed to study circulating pigment epithelium-derived factor (PEDF) in vivo in association with insulin resistance and in vitro in human adipocytes. METHODS: Circulating PEDF (ELISA) and metabolic profile were assessed in 125 Caucasian men. PEDF levels were also assessed in an independent cohort of subjects (n = 33) to study the effects of changing insulin action. PEDF gene expression and secretion were measured during differentiation of human preadipocytes. RESULTS: In all subjects, PEDF was positively associated with body mass index (r = 0.326; P < 0.0001), waist-to-hip ratio (r = 0.380; P < 0.0001), HbA(1c), and fasting triglycerides and negatively with insulin sensitivity (r = -0.320; P < 0.0001). PEDF levels were significantly increased in subjects with altered glucose tolerance and type 2 diabetes. Of the inflammatory markers measured, PEDF levels were positively associated with serum soluble TNF-a receptor 1 and IL-10 in obese subjects. Interestingly, weight loss led to significantly decreased PEDF concentration from 34.8 ± 19.3 to 22.5 ± 14.2 µg/ml (P < 0.0001). Multiple linear regression analyses revealed that insulin sensitivity contributed independently to explain 14% of the variance in PEDF levels after controlling for the effects of body mass index, age, and log fasting triglycerides. Differences in PEDF observed after weight loss were related to changes in obesity, insulin resistance, and blood pressure measures. PEDF gene expression and secretion increased during differentiation of human preadipocytes. CONCLUSION: Circulating PEDF is associated with insulin sensitivity. The findings show, for the first time in humans, that PEDF concentrations decrease significantly after weight loss in association with blood pressure. PEDF seems to be involved in human adipocyte biology. Sabater et al., J Clin Endocrinol Metab. 2010 Oct;95(10):4720-8. Epub 2010 Jul 14. Two functional epitopes of pigment epithelial-derived factor block angiogenesis and induce differentiation in prostate cancer. Pigment epithelial-derived factor (PEDF), an angiogenesis inhibitor with neurotrophic properties, balances angiogenesis in the eye and blocks tumor progression. Its neurotrophic function and the ability to block vascular leakage is replicated by the PEDF 44-mer peptide (residues 58-101). We analyzed PEDFs' three-dimensional structure and identified a potential receptor-binding surface. Seeking PEDF-based antiangiogenic agents we generated and tested peptides representing the middle and lower regions of this surface. We identified previously unknown antiangiogenic epitopes consisting of the 34-mer (residues 24-57) and a shorter proximal peptide (TGA, residues 16-26) with the critical stretch L19VEEED24 and a fragment within the 44-mer (ERT, residues 78-94), which retained neurotrophic activity. The 34-mer and TGA, but not the 44-mer reproduced PEDF angioinhibitory signals hinged on c-jun-NH2-kinase-dependent nuclear factor of activated T cell deactivation and caused apoptosis. Conversely, the ERT, but not the 34-mer/TGA induced neuronal differentiation. For the 44-mer/ERT, we showed a novel ability to cause neuroendocrine differentiation in prostate cancer cells. PEDF and the peptides bound endothelial and PC-3 prostate cancer cells. Bound peptides were displaced by PEDF, but not by each other, suggesting multiple receptors. PEDF and its active fragments blocked tumor formation when conditionally expressed by PC-3 cells. The 34- and 44-mer used distinct mechanisms: the 34-mer acted on endothelial cells, blocked angiogenesis, and induced apoptosis whereas 44-mer prompted neuroendocrine differentiation in cancer cells. Our results map active regions for the two PEDF functions, signaling via distinct receptors, identify candidate peptides, and provide their mechanism of action for future development of PEDF-based tumor therapies. Filleur et al., Cancer Res. 2005 Jun 15;65(12):5144-52. Binding of the biotinylated peptides to HUVEC and PC-3 cells. A, HUVECs were incubated with biotinylated peptides (34-merB and 44-merB) and the binding measured by fluorescence-activated cell sorting. B, peptide binding to PC-3 cells. C and D, competition analysis. 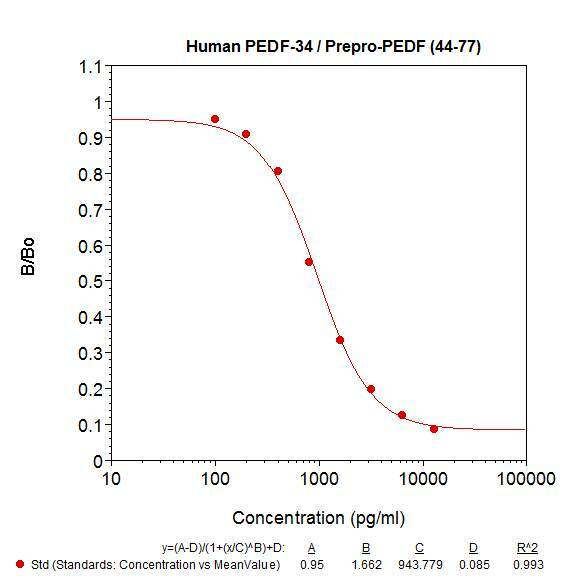 The 34-mer and 44-mer binding to the endothelial cell displaced with 10?excess of unlabeled PEDF (C) 34-mer binding to PC-3 cells displaced with 10?molar excess of unlabeled PEDF or with 100?excess of 44-mer (D). Nonbiotinylated peptides were used as controls. Identification of the neuroprotective molecular region of pigment epithelium-derived factor and its binding sites on motor neurons. Pigment epithelium-derived factor (PEDF), a member of the serine protease inhibitor (serpin) family, is a survival factor for various types of neurons. We studied the mechanisms by which human PEDF protects motor neurons from degeneration, with the goal of eventually conducting human clinical trials. We first searched for a molecular region of human PEDF essential to motor neuron protection. Using a spinal cord culture model of chronic glutamate toxicity, we show herein that a synthetic 44 mer peptide from an N-terminal region of the human PEDF molecule that lacks the homologous serpin-reactive region contains its full neuroprotective activity. We also investigated the presence and distribution of PEDF receptors in the spinal cord. Using a fluoresceinated PEDF probe, we show that spinal motor neurons contain specific binding sites for PEDF. Kinetics analyses using a radiolabeled PEDF probe demonstrate that purified rat motor neurons contain a single class of saturable and specific binding sites. This study indicates that a small peptide fragment of the human PEDF molecule could be engineered to contain all of its motor neuron protective activity, and that the neuroprotective action is likely to be mediated directly on motor neurons via a single class of PEDF receptors. The data support the pharmacotherapeutic potential of PEDF as a neuroprotectant in human motor neuron degeneration. Bilak et al., J Neurosci. 2002 Nov 1;22(21):9378-86. Both the full-length and the 44 mer region of human PEDF protect motor neurons from glutamate-mediated cell death. Motor neuronal protection was assayed by measuring ChAT activity (A-C) and by counting motor neurons in spinal cord slices (D-F). A, Incubation of spinal cord slices with a glutamate transporter inhibitor, THA, on average reduced motor neuron ChAT activity to 44% of the untreated controls (*p < 1 × 10-24) after DIV 42–49. B, In the same experiments, the 44 mer of PEDF peptide prevented loss of ChAT activity because of chronic glutamate exposure in a dose-responsive manner (*p < 0.05 vs THA control).hR-PEDF, rhuPEDF. 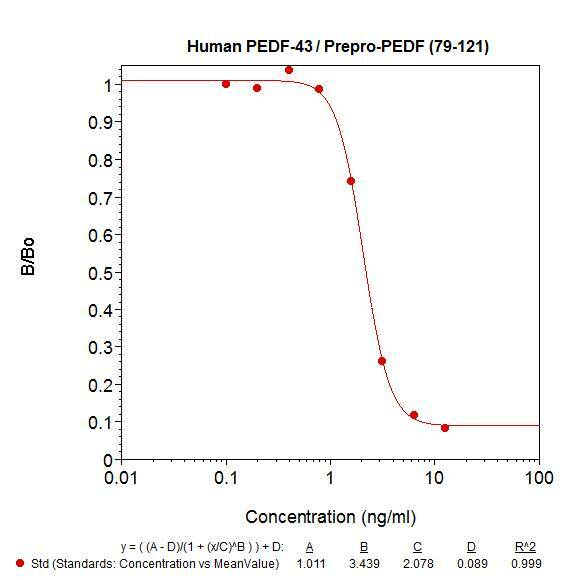 C, When we compare the neuroprotection index (percentage of neuroprotection inB minus the THA control) of each peptide at effective stoichiometric concentrations (4 nm shown), the neuroprotective effect of full-length PEDF can be completely accounted for by the 44 mer but not by the 34 mer (*p < 1 × 10-6 vs THA alone). D–F, Motor neuron survival was assessed by counting SMI-32 immunostained pyramidal neurons in the ventral horn. 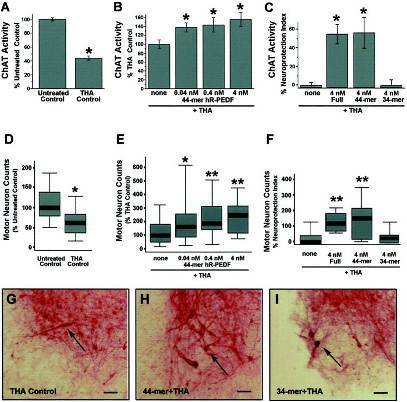 D, Incubation of spinal cord slices with a glutamate transporter inhibitor, THA, reduced the motor neuron number on average to 60% of untreated controls (*p < 1 × 10-4) after DIV 42–49. E, The 44 mer of PEDF peptide prevented motor neuron loss in a dose-responsive manner. *p = 0.06; **p < 0.02 vs THA controls.F, A neuroprotection index was used to compare the action of each PEDF peptide on motor neuron survival at stoichiometrically equivalent 4 nm doses. In agreement with ChAT assay data, the full-length PEDF and the 44 mer but not the 34 mer significantly enhanced motor neuron survival. **p < 0.02 vs THA control; n = 13–15 spinal cord slices per experimental group. G–I, Immunocytochemistry of organotypic cultures for nonphosphorylated NF-H in neuronal cell bodies and their processes. In cultures exposed to 100 µm THA, NF-H immunostaining reveals a severe loss of motor neurons in the ventral horn (G). Concurrent treatment of THA-intoxicated cultures with the 44 mer (0.4 nm shown) dramatically and reproducibly preserves motor neurons (H), and the cultures appear similar to those treated with full-length PEDF (data not shown). In contrast, treatment with the 34 mer (0.4 nm shown) does not prevent the THA-mediated loss of motor neurons (I), and the cultures appear similar to those treated with THA alone (G).Arrows, SMI-32-positive motor neurons. Scale bars, 100 µm. Tips: See immunoassay kits curves and sequence by clicking the tabs on the top.